There are many well-known herbal flowers I’ve had the privilege of using over the years…lavender, chamomile, calendula…all very popular in any herbal arsenal. But one flower that I’ve often overlooked and kept in the “for decoration only” category, has recently caught my attention for its wonderful herbal properties. The beautiful, fragrant rose. For years I loved roses because they brightened up my home décor and brought a fresh scent to a room. But over the last few months I’ve been reading up on how useful this flower can be in any herbal apothecary. From using rose water in skin care to tea to baked goods, this flower has any array of uses for health and home. Let’s explore! Before we dig in to all of the great ways to use roses, I just want to touch on what you want to look for when you get your roses. You ALWAYS want to use roses that have not been sprayed with any chemicals, pesticides, etc. Whatever was put on the flower or into the soil it’s growing in, will end up in whatever you make with the petals…and you don’t want to be eating that or putting in on your skin. So buying a bouquet from your local super market isn’t going to work. The best options for fresh petals are to grow your own roses or get them from someone who does, without the chemicals. You can also buy dried organic roses from a reputable herb company like Bulk Herb Store. So what can you do with this sweet smelling flower? Historically, roses were used for baths and perfumes because of their wonderful aromatic qualities. As time has gone on, the medicinal uses for roses have grown. There are many methods for using rose including teas, herbal baths, and infused oils. But one of my favorite ways to make use of rose is with rose water. Rose water contains all of the essence of the rose petals – the chemical constituents that provide all the benefits for the uses listed above. Not only does it contain all of the medicinal benefits of roses, the water also takes on the wonderful scent of the flower as well. Rose water can be conveniently used as a facial toner, acne, treatment, or refreshing body spray. You can also drink rose water when added to your favorite tea and even add it to elegant baked goods. Steam distilled method- this a more traditional way of making rosewater that involves distilling water in a pot with rose petals, allowing the rose to infuse into the water. This method is more involved and time consuming, but would yield a great product in the end. Cooking method – this is done by adding the rose petals and water to a double boiler, and slowing simmering until the color has left the petals. It’s a quick method that is less labor intensive, but the end product may not be as strong as if steam distilled. Hot water infusion – and even quicker method, this involves placing the rose petals in a jar, pouring boiling water over them, and allowing it to sit for several hours. When making rosewater, no matter the method, it is best to use fresh rose petals, not dried. And as mentioned above, you want to make sure they are from a source that does not spray or add chemicals. For my rosewater, I chose to utilize the cooking method. As a busy mom of five, I knew this would be a less complicated, involved way of getting my rosewater, but still have a quality product. So here’s how you make it! In the double boiler, add rose petals and water. On low/med heat simmer water and petals until they lose their color. You do not want a hard boil here, just a light simmer. Once the petals are done simmering, remove from heat and allow the water to cool. Once cool, strain the water into a mason jar. Store in the refrigerator or cool dark location. It will last for about a year. I used a bright pink rose for my water, so the water took on the same beautiful color. You can use a different colored rose such as yellow or peach, but your water will have a different look. So now that you know why roses are so great and how to make your own water, you’re probably wondering what you can do with it. There truly are so many options on how to use your rose water, but I will share a few of my favorites. What are your favorite ways to use roses? Have you made other floral waters and what have you done with them? Tierra, Michael. (1998.) 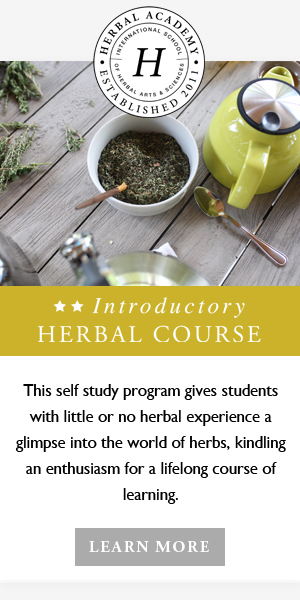 The Way of Herbs. New York, NY: Pocket Books. Katie Sandy is a wife and mom to five amazing kids. She is a certified aromatherapist who loves essential oils, as well as herbs, and finding ways to combine them both as part of a more natural lifestyle for her family. Her passion is to help other families by sharing aromatherapy and herbal information, usage tips, and recipes. You can find all this and more over at Genesis Essentials.